This is a cotton dish towel with an embroidered spotted dog. It is 12 inches folded. This double sided Valentine’s Day towel has been folded in half, for double the thickness and hand crocheted with a white top. 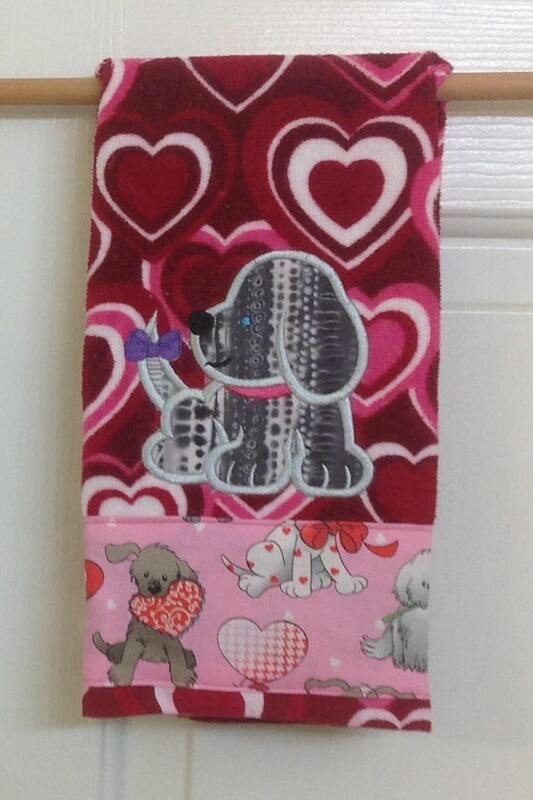 The design features a heart with a dog that says I woof you, the background has pink bones and red hearts. the back has pink bones and red hearts. This towel is terry cloth and hangs 21 inches. This double sided Valentine’s Day towel has been folded in half, for double the thickness and hand crocheted with a white top. The background features a design of dog bones and hearts, with an appliqued heart with a puppy and the saying Be Mine. The back has the bone and heart background. This towel is terry cloth and hangs 21 inches. This towel will brighten up your kitchen for Valentine’s Day! My mother used to make towel toppers with fabric, she was a great seamstress. Occasionally one with a crocheted top would show up. As a teen I didn’t give them much thought…in fact I was a bit of a brat and probably made a snarky remark or two about them. Well I’m all grown up now and they are one of my favorite things! In fact, I am obsessed! I love to have a towel set aside especially for hand drying and I spend a lot of time in the kitchen. I have one by the sink and one hanging on the oven door. I think they could be quite useful at the powder room sink as well. I know these are unique and can be difficult to find these days, but I love how handy they are to have. See that…obsessed! They make a great hostess gift and it’s a great add-on for a bridal or baby shower. It’s a wonderful stocking stuffer! A great idea for a “thinking of you” gift. You’ll want to keep a few on hand because all your houseguests will want yours. My mother-in-law and sisters-in-law LOVE theirs!!! They make great useful gifts! This is a FULL SIZE dish towel folks! A super great value because you’ll find most available on the market have been cut in half to make two. I’ve designed this topper myself so the topper is super firm and dense crochet cotton. Super soft, plush cotton printed towel. Crochet cotton topper adds approximately 4 inches and fastens with a button. All towels are uncut using the entire towel, so it is double thick! I put a button on each side so it is reversable if wanted. Double thick means not washing as often and lasts longer. Tops are color coordinated using heavy yarn, machine washable, can use color safe bleach. Hand crafted in a smoke free home. Handy in the kitchen, bath, rv, cabin, golf, or fishing! Makes a great gift for everyday use. All towels can be made to go over knobs! Send me a message if you are looking for a special color or theme. I do everyday and all holiday patterns!! Happy Shopping and have a wonderful day. 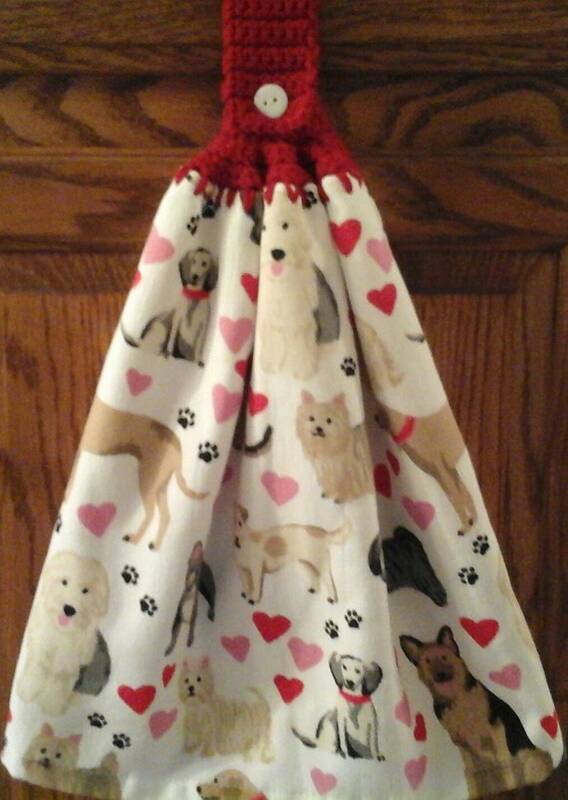 Pink and Red Heart and Dog Bones Kitchen towel to give at Valentine’s Day, your Anniversary, as a wedding gift, or to the Dog lover on your list. 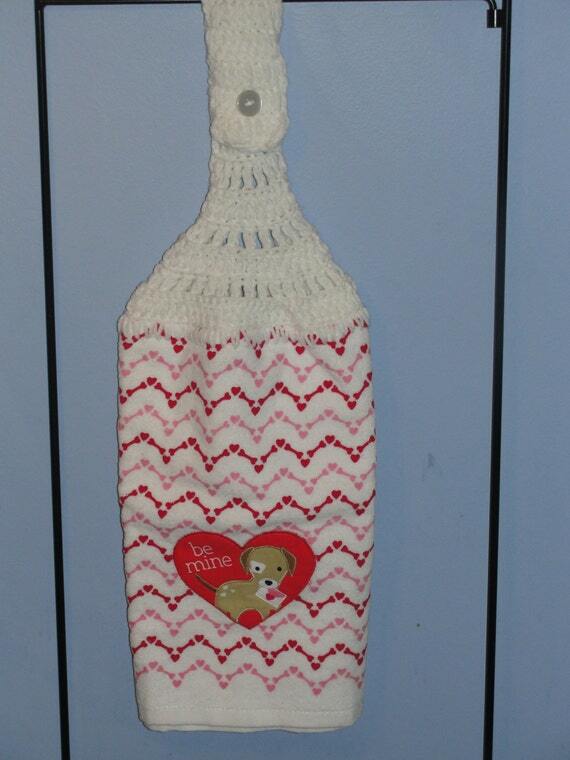 Great decorative hanging towel to add some Valentine whimsy by hanging from a drawer pull, stove or oven handle, towel rod, or your cooler handle. Made from one half of a terry cloth towel and machine and hand stitched to last thru many washings. The cloth top along with the plastic working button with machine button hole will keep the towel attached. 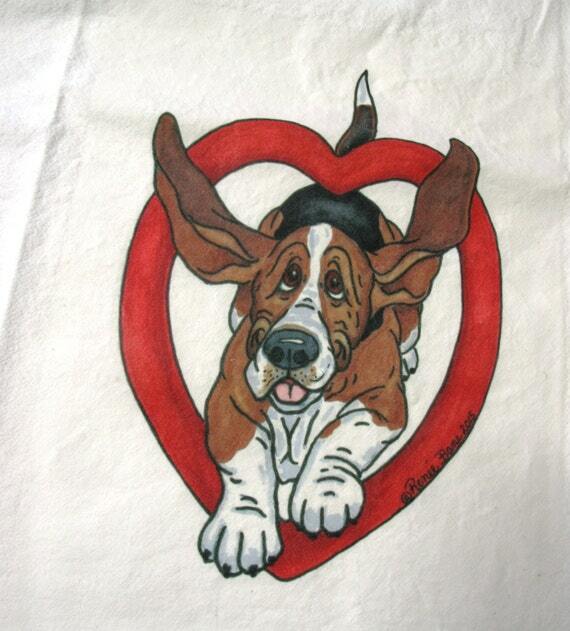 This happy Basset will jump for joy if you’ll be his valentine! These flour sack tea towels are made of high quality 100% cotton and are lint free. The perfect towel for your kitchen, bathroom or as a gift for that someone special. Just about any of my towels can have different colored tops crocheted on them. Just about any of the towels can be made in to a single or double towel. If your looking for a certain themed towel for kitchen let me know and I will look for something. Please send me a message if you have any questions. If you would like the towel shipped to anywhere other than the U.S. or Canada please message me and I will get you a shipping price. Remember your first crush and how exicited you were-just flooating on air!! 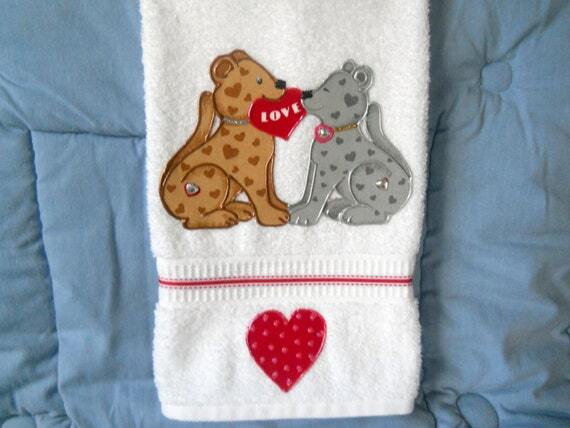 “Puppy Love” is what we call it and this Valentine hand towel depicts this. Two cute little puppies sharing their heart. These guys would love to add some Valentine’s Day love to your bathroom or kitchen this year. This is a full size cotton hand towel that has been appliqued and then hand painted. A Valentine theme ribbon has also been added for a little extra pop. This towel is machine washable in warm water and can be put in the drier. I gladly ship internationally. Send a message prior to purchase and I will quote shipping for your region. Using buttons makes it much less likely that the towel will fall off on the floor. And less washing means it will last longer! 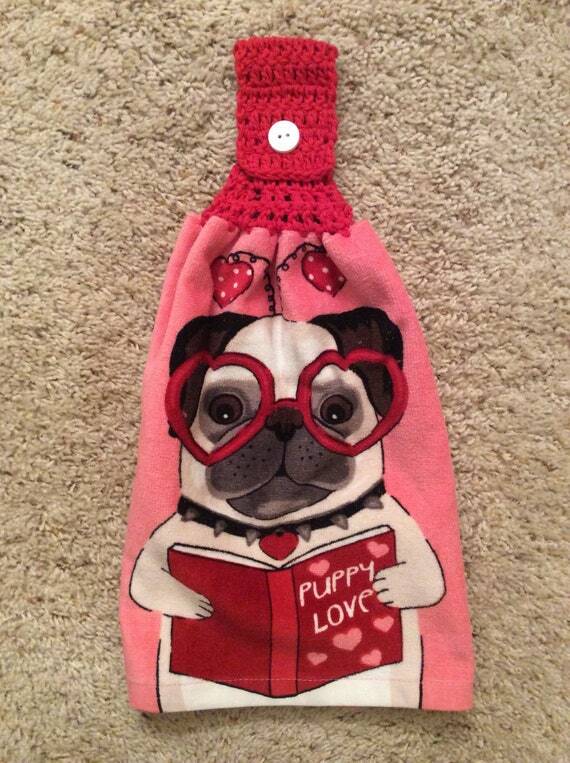 Beautiful and plush towel with a dog reading a book called Puppy Love! Also great in your bathroom, RV, boat, cottage or even your golf bag! 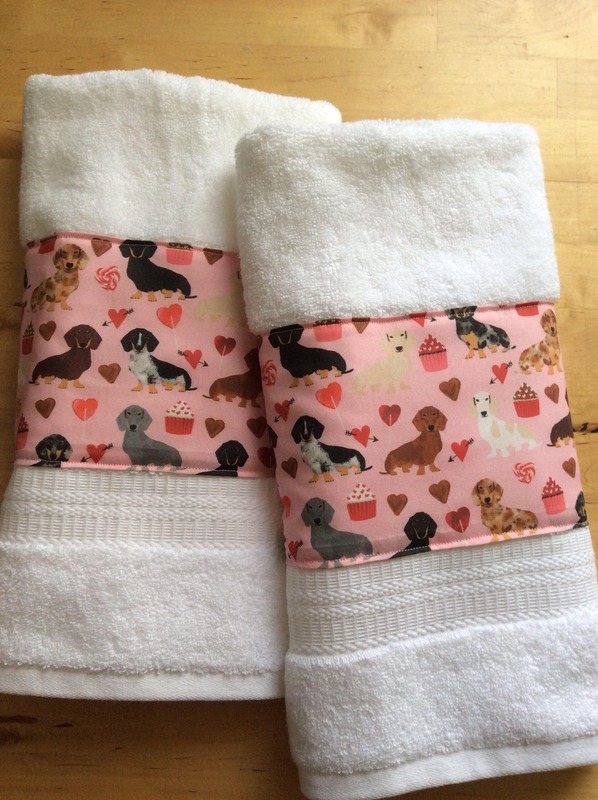 Set of two cotton bath hand towels with a Dachshund Valentine/ heart theme. The fabric is a cute print on quality white hand bath towels. Great black poodle gifts to celebrate Valentine’s Day and your love for poodles. 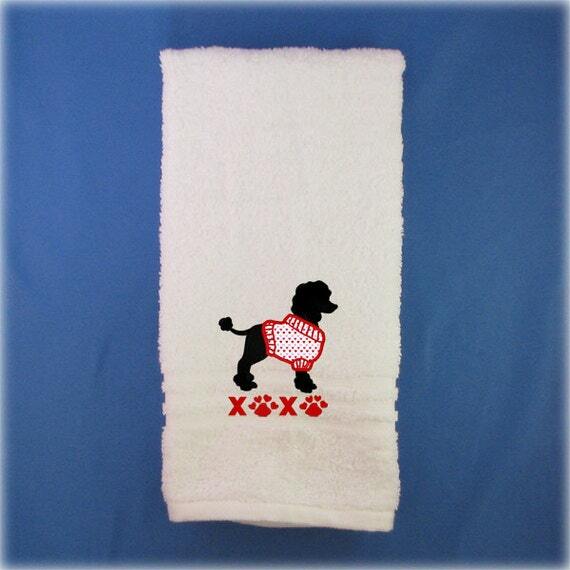 These embroidered Valentine poodle towels make great decor for your bathroom or kitchen and a wonderful gift for a poodle dog lover. 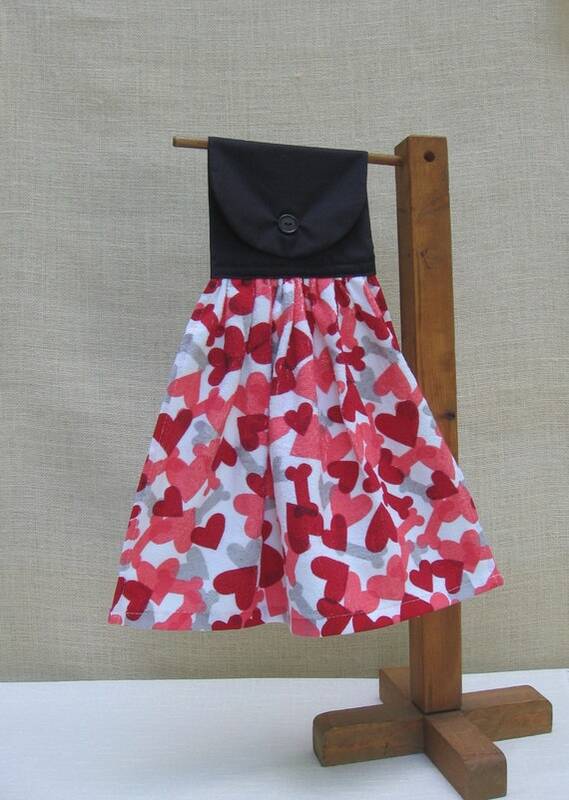 This is a cute applique design using a three color heart fabric for the body of the poodle. Hand towels are highly absorbent, and made of 100 percent cotton, and have a finished hem for long-lasting quality. They measure approximately 26x16inches and are available in white, pink or red. Great Italian greyhound gifts to celebrate Valentine’s Day and your love for greyhounds. These embroidered Valentine greyhound towels make great greyhound decor for your bathroom or kitchen and a wonderful gift for a greyhound dog lover. This is a cute applique design using a three color heart fabric for the body of the Italian greyhound. 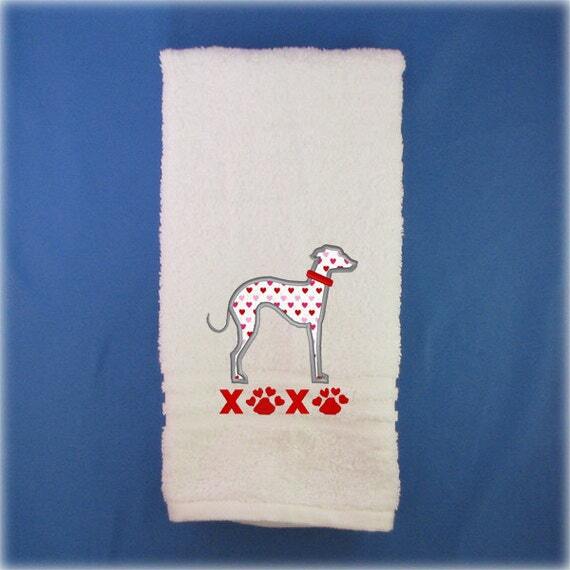 These Italian greyhound hand towels make perfect the Valentine gifts for dog lovers. 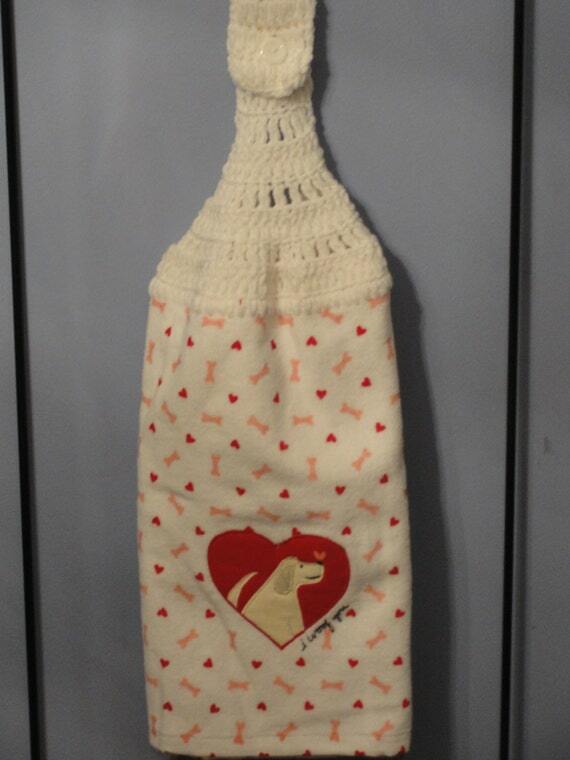 A Valentine greyhound towel makes great bathroom decor or kitchen décor and is a wonderful gift for a greyhound dog mom. 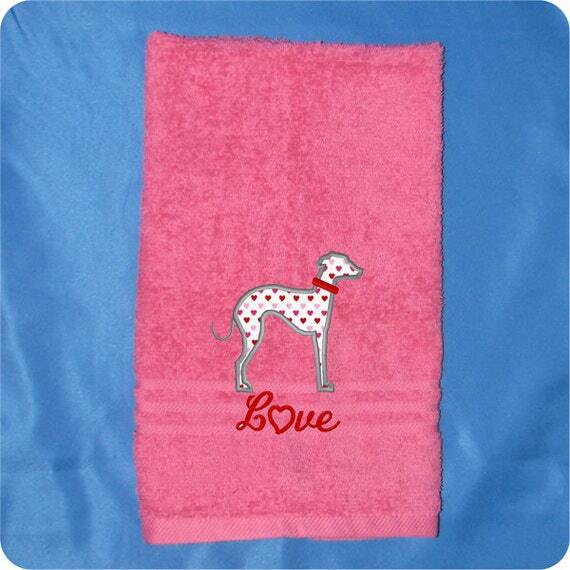 This is a cute applique design using a three color heart fabric for the body of the greyhound.